Pick three Charlottetown Festival shows and pay only $140! Buy your PICK-3 PASS now and save up to $90 or 35% off regular ticket prices! PICK from Kronborg – The Hamlet Rock Musical, Anne of Green Gables-The Musical™, Mamma Mia!, Spinning Yarns, and Atlantic Blue. Any show, any date, any seat! Book your tickets when you buy the pass, or leave that decision until later. You’ll have access to the best seats available when you choose to book. Customize your Charlottetown Festival experience and lock in your savings today! Quantities are limited so act fast! What is the Pick-3 Pass? 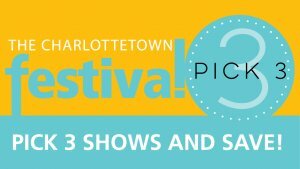 The Pick-3 Pass allows you to choose any three shows in our 2019 Charlottetown Festival season. The Pass allows you to lock in a lower ticket price in advance – a savings of up to $90 or 35% off regular price tickets – while still giving you the flexibility to plan your schedule later. How Does the Pick-3 Pass Work? The Pick-3 Pass is like purchasing season tickets without committing to a set schedule. It’s like creating your own personal Charlottetown Festival subscription – selecting the shows and dates you prefer. Some conditions apply. Based on availability. Limited quantity available. Excludes VIP seats for Anne of Green Gables – The Musical™. Not valid with any other offers or promotions. Taxes and service charges extra.